Maranda Johnson is a model student with a not so model journey. In high school, teachers told Johnson that she was not “college material” and she “shouldn’t bother applying,” but four years later, she has defied the odds set against her. Coming to school as a first-generation college student with only the savings she earned from working through high school, the application process was nothing less than a challenge to navigate and afford. “My mom wanted me to go to college, but she didn't know how I would get there, financially, because through my entire experience the most she could contribute was groceries,” said Johnson. She did not let the financial constraints of earning a degree stop her from pursuing her passion though. Instead, Johnson used her obstacles to fuel her ambitions. In addition to qualifying for Free Application for Federal Student Aid (FAFSA) and earning a scholarship for being among the top ten percent in her field at UNT, Johnson earned a $3,000 Chartered Property and Casualty Underwriters Loman Foundation Scholarship and a $2,500 Insurance Council of Texas scholarship. For two consecutive years, she also earned the Joe D. Heffner Award in Insurance—a notable honor given to just one UNT insurance student a year, based on merit and faculty recommendations. The drive and ambition Johnson embodied throughout her academic career ultimately enabled her to not only afford college, but also graduate completely debt-free with a double major and full-time job offer. Her degree in risk management and insurance, coupled with her degree in finance, opened up doors that Johnson did not even know existed. Doors like traveling the nation, and the world. Other than one high school trip, Johnson had not experienced much life outside of Texas. Once a part of the College of Business, however, she expanded her horizons by traveling as much as “a show tour.” She visited more than twenty conferences and programs during her time at UNT, including across seas, around the country and within the state. Even more than academic pursuits, Johnson was also heavily committed to the community; accumulating hundreds of hours of community service while serving in leadership positions on as many as nine organizations at a time. Her allegiance earned her the most prestigious award given to student leaders for making an impact at UNT—the Golden Eagle Award. “I was excited, happy and proud to earn the Golden Eagle Award. Making an impression on your campus is something that you dream about—not just to be a student, but to impact the people around you,” said Johnson. Johnson’s vast list of accomplishments are bound to grow after graduating. She was hired (nearly a year prior to graduating) to work for the American International Group (AIG) as their commercial property underwriter and is set on coming back to UNT to continue serving in the organizations that helped her feel at home. 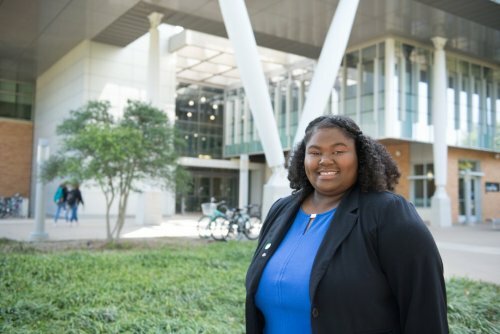 With a degree from UNT, and a whole lot of ambition, Johnson was able to completely transform her future and develop herself into a marketable asset to the UNT community and beyond.